I realized that i haven’t said much about Greece’s situation during WWII and i decided to make a post about it. Greece was one of the most tragic occupied countries during the war. I’m not going to talk about everything in this article but i am going to concentrate on specific subjects. Before beginning though, i would like to say a word about the featured image of my article. It’s a mother and her son before leaving for the battle. She gives him to kiss a Christianic religious picture and probably wishes him that God shall be by his side. It is one of the most moving pictures from the WWII in Greece in my opinion, and that’s why i chose it. How did the Occupation start? In April 1941 and while the WWII had already began, Nazi Germany invaded Greece, to help their allies, Fascist Italy. Italy had been at war with Greece since 1940 but the Hellenic Army managed to send their forces away. It was also when the Greek prime minister Ioannis Metaxas said no to the ultimatum made by the Italian didactor, Benito Mussolini. Hence our national celebration every 28th of October, when we celebrate the ”No” (No Day – ΟΧΙ in Greek) we said to Italy. That was when the Occupation of Greece began. The Occupation ruined the Greek financial situation and many awful events occurred as the conditions were terrible. For instance we had the Distomo massacre when Nazi Germans killed innocent people in the village of Distomo, or the unknown holocaust in Kommeno village. Those incidents were and still are terrible crimes for the Greek people (and not only, since the Nazis killed so many people all around the world) that were never punished. Even though German soldiers that took place at those crimes have confessed, it was and still is, like it never happened. As you can see, the women of Greece helped significantly during that time no matter their age. Hundreds of thousands of women had joined the army to defend Greece while thousands were killed during the battles. Many women were also executed by the Germans for their fights against them. So during the last year of the Occupation, the Greeks had created an illegal newspaper the ”Radio News” (Ραδιοφωνικόν Δελτίον in Greek) with the news of BBC. The Greeks were risking their lives every time they were about to publish it. It was known that the radios were also banned so they had to illegally bring the news by BBC and others’ to the people. You can see pictures of the illegal newspaper here! 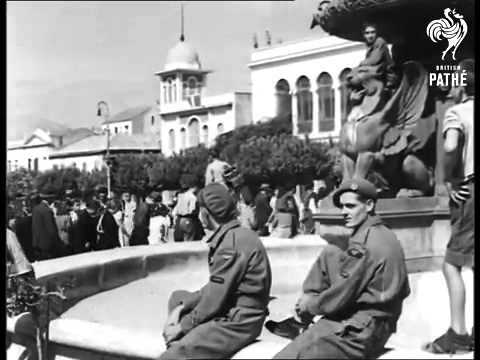 The Greek Occupation ended on 1944 but the crisis after it, brought the Civil War. This was an advantage for the Nazis not only to not be punished, but also to become the ruling class after the war (defeating the communists). In the video below you will be able to see many scenes that were recorded at that time. The faces of the people and their movements remind us of how different everything was back then. So these were a few basic things about Greece’s Occupation. I really hope you enjoyed today’s post and hopefully you learned some new things! Thank you very much for reading! I will see you all on my next post! Previous postThe history of hospitality!